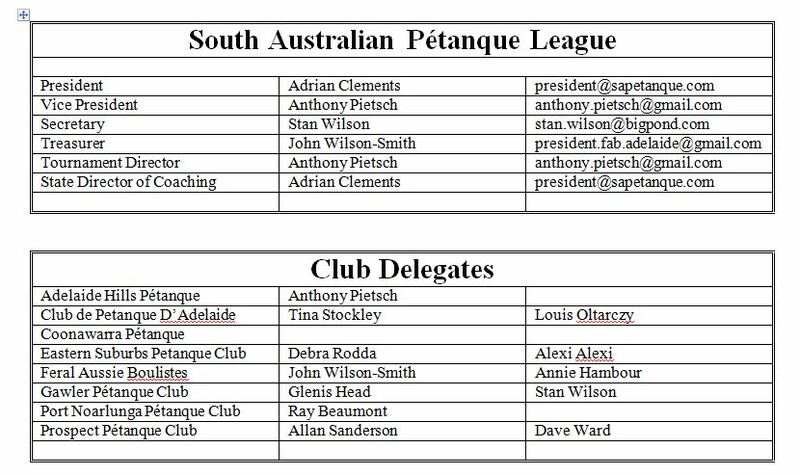 The South Australian Pétanque League (SAPL) is the administrative body of its South Australian member clubs. SAPL is affiliated through Pétanque Federation Australia (PFA) with the Federation Internationale de Pétanque et Jeu Provencal (FIPJP), the world governing body of pétanque. South Australian members are eligible to participate in local, national and international competitions.The SAPL is responsible for an interclub competition and most major pétanque events held in South Australia. We endeavour to promote this wonderful game/sport, increase its participation in South Australia and to provide an environment and an organisational structure in which pétanque can be enjoyed. The SAPL financial year runs from 01 July till 30 June the following year and the AGM is held within 6 weeks of the end of the financial year. A SAPL committee meeting is held regularly. Each club is represented by members nominated by the respective Club committees. Based in South Australia, the SAPL has 9 member clubs.